Amaju Pinnick has returned as President of the the Nigeria Football Federation (NFF) after elections announced on Thursday, September 20. 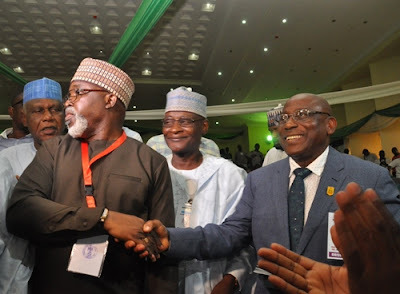 Amaju Pinnick emerged winner in new NFF election The incumbent President of Nigeria Football Federation (NFF), Amaju Pinnick has been re-elected for a second term in office. According to a revelation made on the verified Twitter handle of the NFF, Pinnick won the election by 34 votes. 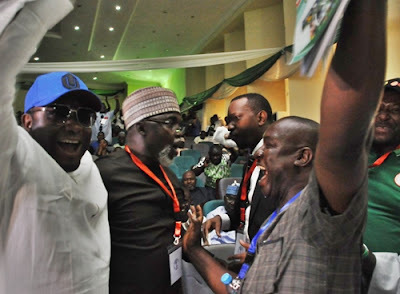 Pinnick being congratulated by his opponent Other contestants are, Aminu Maigari who got 8 votes, Taiwo Ogunjobi who got 2 votes, and Okoye who got zero votes.